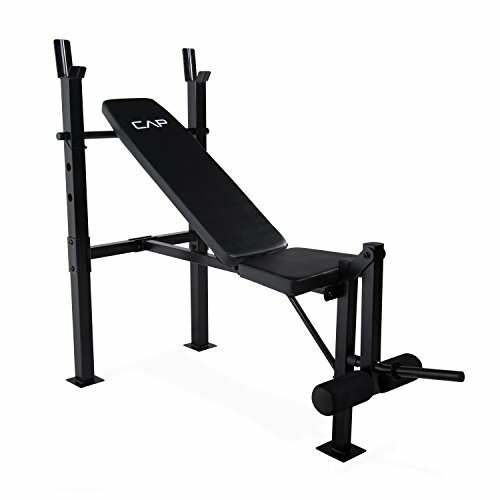 The cap standard bench with leg lift is the perfect weight bench for the beginner to intermediate weight lifter. The adjustable bench features a back pad that adjusts to incline & flat chest press positions. It accommodates most standard barbell sets with a 5- to 6-foot bar. The leg lift is designed to target hamstrings, quadriceps, and gluts muscles. Made of durable 14-gauge, heavy duty steel tube frame with a powder coated finish. Designed w/high density upholstery and contoured foam roller ankle pads and has a 300-lb. Weight capacity (user + weight).